MUSIKMESSE 2011 Press Release: Jaden Rose Guitars has confirmed that it will be exhibiting for the second year running at the forthcoming Frankfurt Musikmesse. Jaden Rose Guitars is proud to be unveiling the baritone Spider Hz, an 8-string extended range that features an Original Series style carved top mahogany body and bubinga neck. 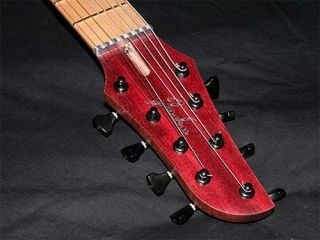 The Spider Hz will be the only instrument at the Musikmesse featuring the new D Activator 8 String (DP819 / DP820) pickups.Jaden Rose Guitars is pleased that their relationship with DiMarzio enables both companies to benefit from combined customer research. In its busiest year yet, Jaden Rose Guitars has launched the Art in Wood series, the Series 2 Standard, Ultralite and Pro range and the Spider Hz - 80string. Jaden Rose Guitars' focus remains as ever on the heavy rock, metal and shred style of player and the instruments that are demanded by this type of musician. Instruments cover a price range from £899 to £4999 and are all designed and built exclusively in the UK to last a lifetime.